The Gunpowder is flowing at an ideal 87 cfs, clear and the water temperature has dropped below the 40 degree mark. Fishing has been quite good considering how cold the air temperatures are. Edge ice is forming in increased amounts downstream from York road. Fishing between York road up to Falls has been the most consistent. Above Falls road the didymo is blooming as normal at this time of year. Streamers are worth a shot up there, fish them slowly and close to the bottom. 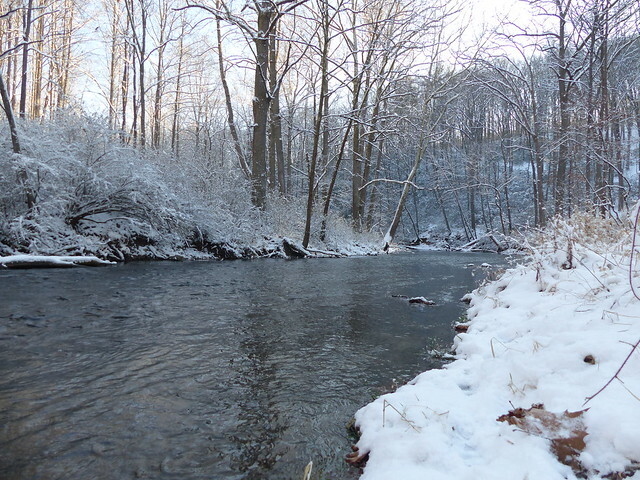 Trout will eat in these cold temperatures but typically don’t move far to intercept food items. I’m finding that tiny pheasant tails, miracle nymphs zebra midges are effective. Anything bigger than a size 16 I find does not produce as much at these temperatures. The most productive time of the day is between 11-3 when the sun is at its highest. At 1 pm today I walked the access points in the catch and release section, i counted 8 fishermen braving the sub zero temperatures, despite having to clear their guides of ice, wild fish were still being caught. 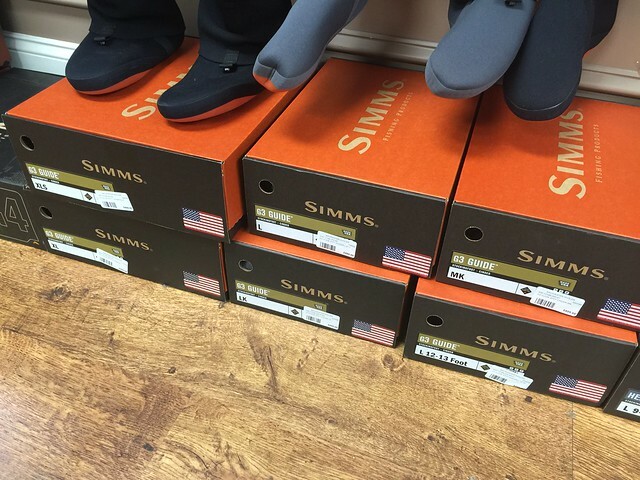 Despite the challenges the cold brings to fishing, you won’t catch fish sitting on the sofa. This entry was posted in fishing report, news on December 29, 2017 by Theaux Le Gardeur. 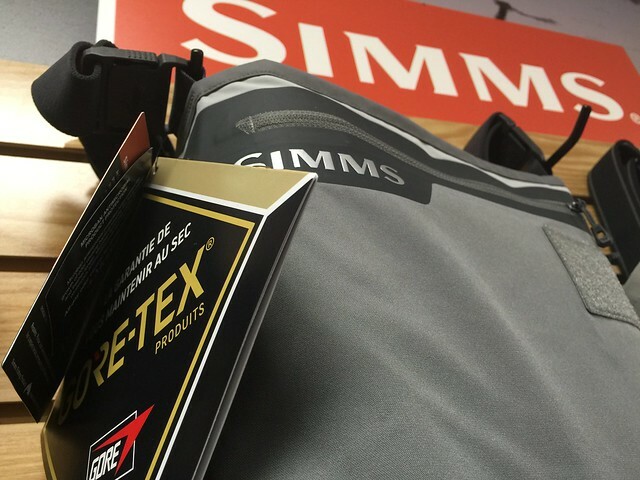 -Three-layer GORE-TEX® Pro Shell in upper. -Four-layer GORE-TEX® Pro Shell in seat and legs. -Removable flip-out Tippet Tender®™ pocket with dual-entry zippers and retractor docking station. -Zippered reach-through microfleece-lined hand-warmer chest pocket. -Super-fly Patch® and integrated utility tabs. -Low-profile belt loops with 2″ stretch wading belt included. -Patented front and back leg seams deliver an articulated fit that fights wear zones, bolsters wader longevity, and maximizes mobility. -Adjustable elastic 1.5″ suspender with opposing YKK® buckles for waist-high conversion. -Abrasion-resistant built-in Gravel Guards with boot hooks. Stop in and see what the fuss is about! This entry was posted in gear, reviews on December 20, 2017 by Gene Howson. Whether you are early or late-fish nymphs or dries or are naughty or nice, Backwater Angler will have extended hours this Holiday season. In December, in addition to our regular weekday hours from 10 AM till 4PM, the shop will also be open Tuesday the 19th and Wednesday the 20th and Tuesday and Wednesday the 26th and 27th. That said, the shop will be closed on Christmas Eve and Christmas Day. We will be open New Years Eve till 2 PM and will be closed New Year’s day and will revert to being closed on Tuesday and Wednesdays through 2018. This entry was posted in news on December 16, 2017 by Theaux Le Gardeur. The Gunpowder is at 74.4 cfs, clear and starting the day 44.5 degrees F. With the drop in air temperatures the fishing has been tricky on the Gunpowder. 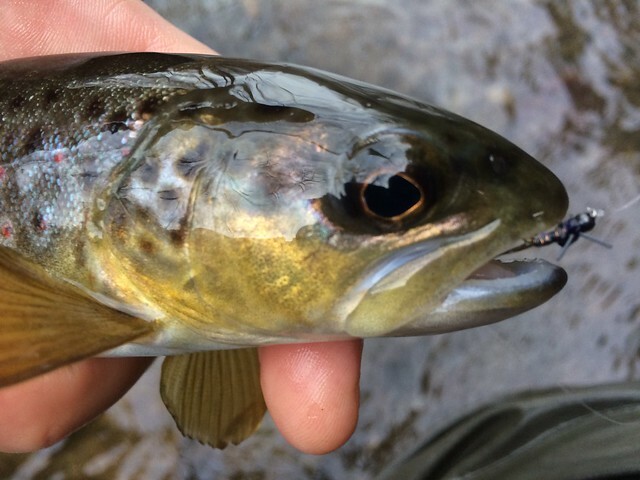 That said, fish are being caught, particularly for those anglers willing to tight line nymph. 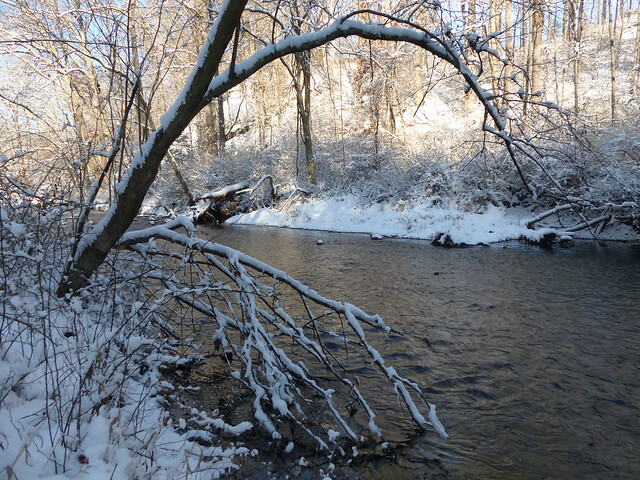 Jim Czawlytko enjoyed two snowy days of fishing over the weekend on the Gunpowder and got into plenty of wild brown trout. Jim found the action was on size 20 grey wd40 midges and size 22 pheasent tail nymphs. Fished with a tungsten beaded jig nymph on the point, which also caught fish. When the going gets cold, getting down to the bottom of the river is neccessery and czech nymphing is the most effective means of achieving this whilsts detecting delicate takes. As the afternoon wears on try a small streamer in the slacker water and back eddies. This entry was posted in fishing report on December 14, 2017 by Theaux Le Gardeur. This entry was posted in gear, news on December 4, 2017 by Theaux Le Gardeur.